Rainland Studios: Bottom of the Ninth Now Available! Bottom of the Ninth Now Available! Bottom of the Ninth is OUT and available for the iPad and iPhone in the Apple App Store. Below is Ryan Woodward's Press Release. Bottom of the Ninth Website. Mapleton, Utah -- June 21, 2012 -- Veteran animator and storyboard artist Ryan Woodward goes indie again with "Bottom of the Ninth", a unique animated graphic novel app designed specifically for iPad. The app is a reflection of Ryan's industry experience, keeping with the integrity of a traditional comic layout, but enhanced with fully animated 2D and 3D animations, an original score, and professional voice actors. Bottom of the Ninth takes place 200 years from now where the game of baseball has evolved into a rough gladiator-type event which sports a vertical infield and artificial gravity to enhance the danger of the game. The epic story starts with the first chapter, "Prologue", which sets up the characters and the world of Tao City. Subsequent chapters will further develop the story and introduce readers to the 18-year-old female protagonist, Candy Cunningham. Candy Cunningham was born with a phenomenal athletic ability. Her father, Gordy Cunningham is an aged major league New Baseball player who's athletic abilities have atrophied into a crowd pleasing clown act. 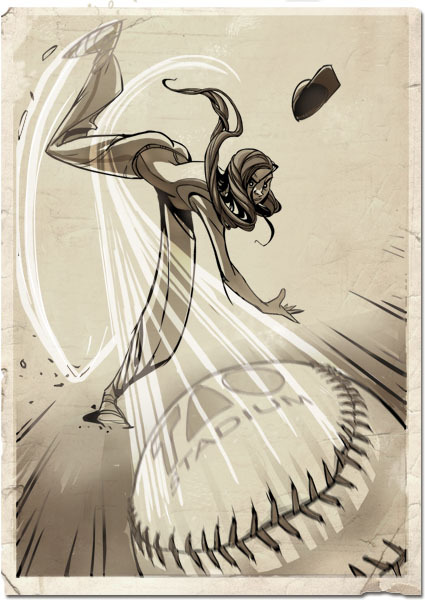 Candy's incredible ability to pitch the fastest pitch in history lands her in the celebrity seat among a New Baseball crazed culture of sports endorsements, advertising and strategic manipulation. The story follows the two characters through the exciting and dangerous world of New Baseball. Ryan Woodward has been a professional animator and storyboard artist since 1995. His screen credits include The Avengers, Snow White and the Huntsman, Ironman 2, Cowboys and Aliens, Spiderman 2 &3, The Iron Giant(’98), Space Jam(’96), etc. His recent independent productions are aimed at creating new genres of storytelling. His last short animated film, Thought of You, won several prestigious awards and is currently rated in the top 10 highest animation plays on Vimeo.com. Ryan created, designed, wrote, penciled, animated, composed, directed and produced this production. His small, yet elite team of dedicated artists assisted in areas of design, 3D animation, and app development. Baseball legend Dale Murphy of the Atlanta Braves lends his voice as "The Murph" a retired legend turned sports announcer. Dale was a 2 time MVP (‘82, ‘83) sporting 398 career home runs. The Bottom of the Ninth App is available for $3.99 from the App Store on iPad or at www.itunes.com/appstore. New chapters of the graphic novel will be available via In-App Purchase as they are released.